I’m dreaming of Arati. Bells are clanging, the scent of incense is in the air. Or wait, no. It’s 5 AM and the temple just down the hill from us has begun its celebration of Shiva. I guess now is a good time to get up and start the day. Yoga this morning is in the yoga hut, a cozy tin roof thatched building on the roof of the hotel. During meditation it begins to rain. The gentle plink of the drops atop the tin roof threaten to lull me into a fetal position on my mat for a little nap. I resist. Once “om”ed out of meditation, a member of our group immediately jumps up and exclaims, “I’m sorry, I just have to go dance in the rain.” With that, she leaves our cozy hut, dancing freely on the terrace. Unable to resist, a second person joins her. We move to one side of the hut to watch, distracted and captivated by the spinning and dancing and joyfulness unfolding before us. Our attention is brought back into the room for yoga as one of the ladies comes back a little soggy but ready to salute the sun as it begins to break through the clouds. The other rain dancer extends her stay on the rooftop then heads back to her room, presumably to take a nice hot shower. Just after savasana our attention is directed outside again. This time it is the black faced monkeys or baboons as Swamiji calls them. They are sitting on the bushes methodically picking the flowers off one at a time and eating them. They get away with it for a while, until a man with a sling shot begins encouraging them back into the trees. Today we will be visiting our second cave. It seems we have uncovered the origin of all the jokes about meditating in a cave for years on end. It is here in India. It really happened. With seemingly great regularity. This cave has been occupied by many, most notably for us, Swami Satchidananda. He did not spend endless days here but did utilize the space for serious contemplation. It’s hopeful some of us will be doing the same. It’s not likely going to be me. Our ride to this cave takes us up a mountain, then down, or maybe around. We definitely go up, skirting oblivion, viewing terraced gardens and whole neighborhoods clinging to the steep hillside. But we also go down. We started at the level of the Ganges and we will be going to the same level, so the whole ride is a beautiful mystery to me. When we arrive, we park behind several other buses. This may not be the quiet, reverent experience we are expecting. While most everyone walks down the uneven, winding steps, a few of us walk back up the hill on the street to capture the vistas on our phones and SD cards. Satisfied we have snapped up enough memories and moments we join everyone else. Along the way we pass a orange clad holy man with hieroglyphics on his forehead. His eyes are shining and his grin is wide. He’s all in. 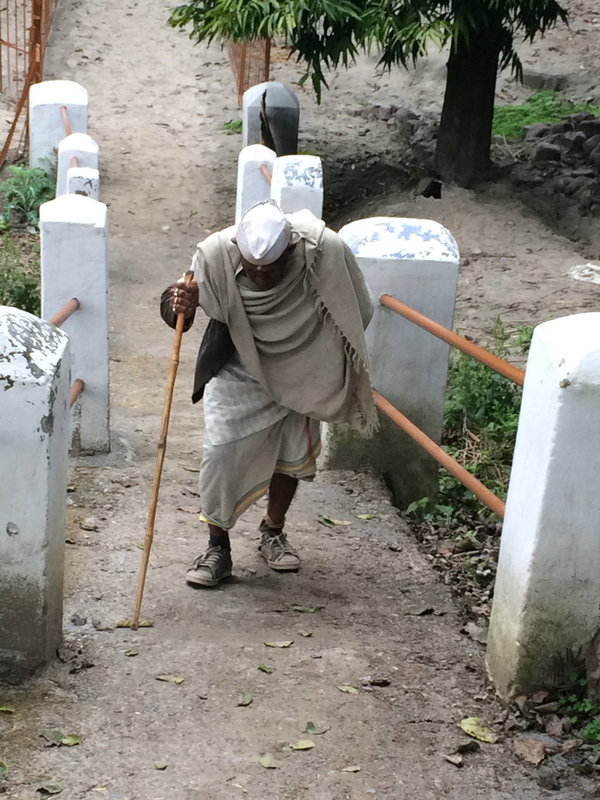 Near the bottom of the steps we pass another aging gentleman in the clothes of a seeker, hunched over his walking stick as he makes his way up the steps in his Chuck Taylor Converse All-Stars. The steps open up to a small ashram or maybe a caretaker’s residence. There are about 6 rooms, presumably for sleeping. Laundry is strung out to dry and a public rest room is nearby. There are several camp style fires set up, one of which is being tended by a resident. There are men working on building a retention wall using twine for measuring and leveling and somewhat primitive hand tools. Yet the wall is perfect. Also on the property is the cave with a temple entry built in front of it. It’s not as crowded as we’d expected. Some of the buses were likely carrying rafting enthusiasts. We remove our shoes and walk in. The gentle aroma of incense seeps out into the temple along with the clear, sweet chanting of a hidden man. The cave itself is nearly pitch black with a single candle burning. Just outside the cave is a ledge and a few of us sit here and close our eyes, while the rest fold up inside. I watch a couple people leave, then decide to go myself. I peek in the cave before exiting, wishing my knee would allow me to sit for just a few moments. Even with the candle and my eyes adjusted for darkness it’s hard to make out shapes. I exit the cave into the soft light of an overcast day. In silence I join a friend, Dayalan, and we begin to walk toward the river. 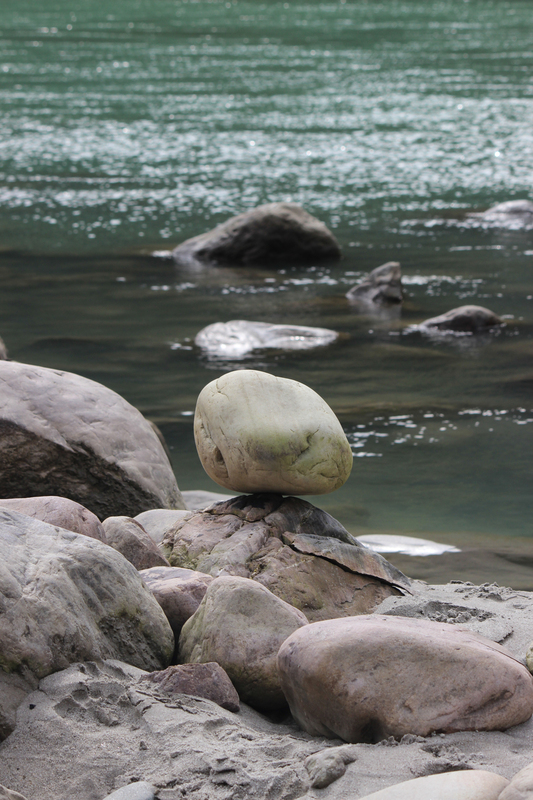 There is a sandy path worn between the smooth river rocks, we follow it. Along the way we notice clothing spread across some of the bigger rocks. 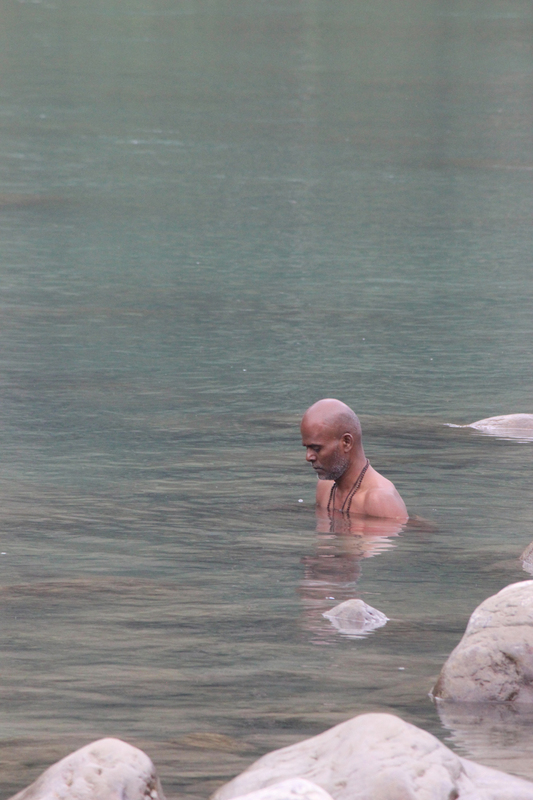 Dayalan says in a contemplative tone, “I wonder if those clothes are symbolic of someone leaving behind their old life, their old ways, shedding their skin and being reborn in the river?” Or something wise and heartfelt like that. I respond, “Or maybe they’re just drying their clothes.” The silence and the moment are broken by our uncontrollable giggling. This is what happens. When you’re in a place where so much is rich with meaning, you begin to search for the hidden messages in everything. Further down we do find clothes in a heap, likely left behind by someone shedding something. We also come upon discarded hair, hastily cut and the razor that did it. Letting go is powerful medicine. And if you’re going to surrender, this is the place to do it. Just then a member of our group walks with purpose from the direction of the cave. Her eyes are focused on the river in front of her. We watch. “There’s always one.” She walks into the river. She is the one. Her husband is behind us and doesn’t know yet that his wife is the statistic. He’s amused when his eyes wander in her direction. His love for her is undeniable as he smiles and walks toward her. The tradition or ritual of immersion involves praying for loved ones then dunking under the water completely, then repeating this sequence twice more. After the third time you emerge cleansed and purified. Our dunkee is now laugh-crying, absolved, freed. It’s a beautiful thing to witness, a private moment made public by its proximity. A handful of us decide to test the waters as well. Just a toe or two. I take my shoes off and walk gingerly over the smooth rocks careful not to slip; concerned more about my camera than myself. The first step in is chilly but not as cold as I had suspected. With both feet in I am held steady by the smooth fine sand and gentle caress of the water. I don’t want to get out. I stay in there long enough for three or four more people to join me. We are standing in the Ganges, this is not lost on us. Lovingly released back onto the rocks we put on our shoes and make our way back toward the cave. Swamiji has emerged from her deep meditation and is now standing with many in our group and looking intently in the other direction. Following her gaze I find that Sethu, our Indian angel guide, is deep in devotion and prayer as he immerses. Right now there seems to be no more sacred a place on earth.